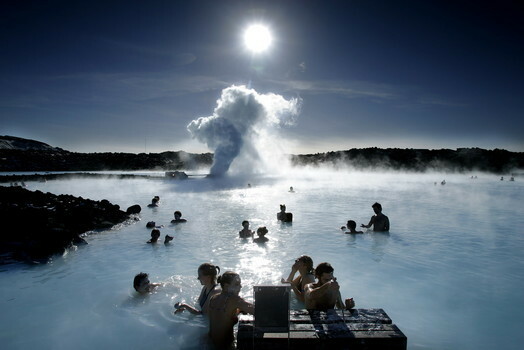 Wake up in the darkness and grab a quick bite at The Laundromat • Head out on the Golden Circle Tour (use Mountaineers of Iceland) and check out the Gulfoss, Geysirs and Langjokull Glacier • Head back from the Golden Circle Tour via The Blue Lagoon. Eat lunch in the Lava Restaurant and then take a dip in the Lagoon. Be sure to book a water massage a couple of weeks in advance. • Head back into Reykjavik and have a drink at Kex Hostel • Eat dinner at The Grill Market. Make a reservation or get just as nice an experience ordering appetizers in the lounge with cocktails • If you have the energy, head out on a midnight Northern Lights tour to chase down the Aurora Borealis • I would stay at: If you're on a budget, stay at Kex Hostel - no question. If you want the best Reykjavik has to offer, stay at Hotel 101. I would stay at: If you're on a budget, stay at Kex Hostel - no question. If you want the best Reykjavik has to offer, stay at Hotel 101. Great boutique hotel and definitely the best place to stay in Reykjavik. In need of a refresh in the next couple of years but still great.